John Bolton still claims the Iraq War was worth the cost and that, in his mind, the worst decision involving Iraq was the “2011 decision to withdraw US and coalition forces”. John Bolton’s recent inclusion in the Trump administration as his new national security advisor is a slap in the face of every Trump supporter who voted for him on his non-interventionist campaign platform – particularly in relation to America’s failures in Iraq (Bolton being one of the leading architects of the war in 2003). Unfortunately for the Middle East and the rest of Asia, Bolton is a man so hawkish that his appointment received open warnings from the Washington Post, the New York Times, the Huffington Post, the Guardian, Vice News, Vox, and Foreign Policy magazine, just to name a few. All of these western outlets have championed US-backed wars at some point in time or another, some of them more so than others. So what makes Bolton’s appointment so dangerous, that even these corporate media outlets were forced to deliver such stern warnings? Most people who are in the business of promoting wars routinely change their mind about a particular war, especially once said war has been commissioned and in turn emerges as a total failure. Bolton is not one of those people. On the contrary, Bolton paved the way for the invasion of Iraq while serving as President George W Bush’s Under Secretary of State for Arms Control and International Security, stating that Saddam Hussein was a “threat to the region” and needed to be “disarmed”. In the years since, he never once admitted the failures of pursuing such a catastrophic course of action in the first place. In 2015 – some 12 years after the US invaded Iraq – Bolton still claimed the Iraq War was worth the cost and said that, in his mind, the worst decision involving Iraq was the “2011 decision to withdraw US and coalition forces”. In 2016, he then took this even further by suggesting that the only mistake of the Iraq War was that the US did not get rid of Hussein sooner. Not to mention that, shortly before the 2003 invasion, Bolton also reportedly told Israeli officials that once Hussein was removed from power, it would then be necessary to deal with Syria, Iran, and North Korea afterwards. Bolton is that man, who views the world the same even after decades of US-led invasions. Approximately a month ago, he wrote an op-ed published by the Wall Street Journal (WSJ) titled “The Legal Case for Striking North Korea First”. His ill-founded view makes zero sense, especially if one were to apply the issue from a North Korean perspective. Does the right of pre-emptive self-defence apply equally to North Korea – a country facing US-led military drills on its borders, combined with the deployment of sophisticated nuclear-capable bombers, while the American commander-in-chief incessantly calls for the destruction of the North Korean state? If not, why? In 2015, Bolton also wrote a New York Times op-ed titled “To Stop Iran’s Bomb, Bomb Iran”. In Bolton’s opinion, “only military action” could accomplish what was required to stop Iran from developing a nuclear weapon, opposing the 2015 Iranian nuclear accord on every level. There’s been far too much debate over whether #Iran is in violation of the #NuclearDeal. The point is that this was a bad deal to begin with and it’s a bad deal now and it should be torn up. As of right now, no official war has commenced against the states of Iran and North Korea, for which we are very fortunate. In order to see how disastrous his advice to Donald Trump will be on these two issues, let us look only to the failures of recent American foreign policy, and compare those failures with the views of Bolton himself. Bolton openly called for the assassination of Libyan leader, Muammar Gaddafi, in 2011, only to later condemn the Obama administration for doing just that. Yet, as we have come to learn, Libya famously had the highest standard of living in Africa, prior to the US-NATO led assault. As the Times noted, Libya’s health care system was “once the envy of the region”. Now, Libya isn’t the envy of anyone, as it has become a lawless haven for extremists who openly trades slaves like a commodity. In Iraq, recent estimates suggest that the US-led invasion of Iraq has killed somewhere between 1.5 and 3.4 million people. The invasion also directly led to the rise of Islamic State (IS), as America’s decision to completely disband Iraq’s military put close to 400,000 servicemen out of work, some of whom went on to hold the most senior ranks of the IS. 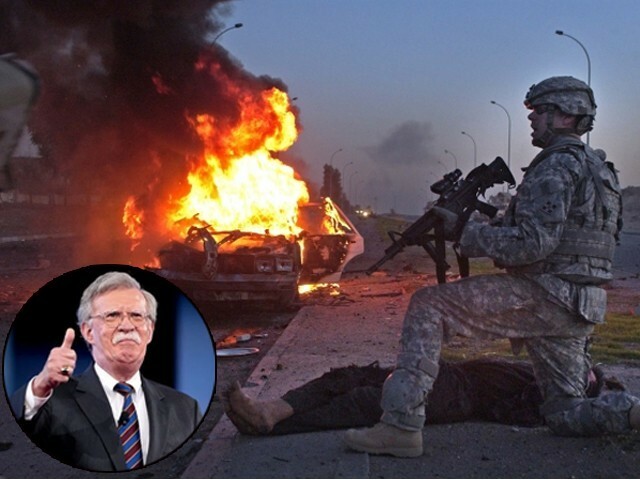 What will it take for the US to learn its lessons from Iraq and Libya, just to name but two, and reject the neoconservative agenda that is amplified by war-hawks like Bolton? After all, the invasion of Iraq was not a good idea, it was not a bad idea, and it certainly was no mistake – it was a crime, plain and simple. To have someone who fails to acknowledge any of these salient facts advising Trump on matters of national security, is nothing short of a recipe for disaster. You Sir have a valid point. The King of the reaality show has a very simple strategy not to allow any hawk operate outside his domain. John Bolton is on the apprentice list to be fired in 2018.